(Nanowerk News) Park Systems announces the 2017 Park AFM Scholarship Award eligible to undergraduate or postdoctoral students working in nanotechnology research either already using Park AFM or who have research they would like to do with Atomic Force Microscope and need help getting access to the equipment. 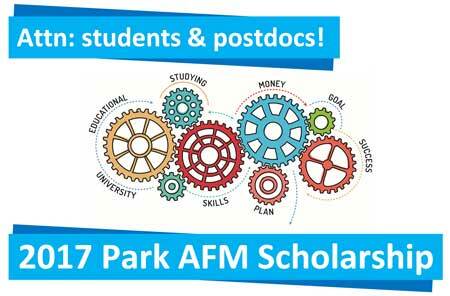 Park will assist researchers who qualify as Park AFM scholars to gain access to the right microscopy tools for their research and are offering a scholarship for those who qualify. Park Systems is now accepting applications which include abstracts from all students and researchers who present research ideas. If you wish to become a Park AFM Scholar submit the application by Dec. 31, 2016 online at http://www.parkafm.com/scholarship. Park AFM Scholars will be selected and notified and winners will also receive an opportunity to have their research profiled in Nano-Scientific, a quarterly print magazine on nanotechnology research distributed worldwide. As progress for nano-scale research and development advances at an unprecedented rate, universities world-wide offer degree programs in nanotechnology. Park Systems, world-leading manufacturer of atomic force microscopes is offering two monetary scholarships to promote the education of future scientists and engineers in a number of nanoscale research areas that require advanced nano microscopy for analysis and to promote shared research findings and methodologies amongst researchers. Park Systems Atomic Force Microscopes are used at thousands of leading institutions world-wide and are known as the premier microscopy tool for accurate nano particle analysis. Park Systems will offer assistance to researchers who need a facility to perform their research using Park Atomic Force Microscope by matching them with one of thousands of shared nano facilities that include Park AFM systems. The patented SmartScan™ operating system has revolutionized the transfer of data to a simple point-and-click system, not dependent on user experience. “With new SmartScan™ on Park AFM, researchers can rely on the accuracy of the data and focus on their research,” adds Lee. The two types of scholarships eligible to Park Atomic Force Microscopy (AFM) Scholars are a $300 scholarship if AFM research in Nanotechnology is conducted at the university where you are a student. Another scholarship of $500 will be award to a Park AFM Scholar if their Nanotechnology Research is selected for presentation at an Academic Conference. To apply, fill out the online application by Dec. 31, 2016 online at http://www.parkafm.com/scholarship. Make sure to have your presentation title and abstract ready. Awardees will be announced on parkafm.com and notified individually. Park Systems is a world-leading manufacturer of atomic force microscopy (AFM) systems with a complete range of products for researchers and industry engineers in chemistry, materials, physics, and life sciences, semiconductor, and data storage industries. Park's products are used by over a thousand organizations worldwide and provide the highest data accuracy at nanoscale resolution, superior productivity, and lowest operating cost thanks to its unique technology and innovative engineering. For its efforts to advance imaging methodologies and enhance the user experiences, Park has been awarded the Frost & Sullivan 2016 Global Enabling Technology Leadership Award. Park Systems, Inc. is headquartered in Santa Clara, California with its global manufacturing and R&D headquarters in Korea. Park's products are sold and supported worldwide with regional headquarters in the US, Korea, Japan, and Singapore, and distribution partners throughout Europe, Asia, and the Americas.